Four Palm Harbor siblings are on a mission to bring their dad home. Scott Piwinski has terminal throat cancer and the community is now coming together to grant his final wish. PALM HARBOR, Fla. — Four Florida siblings were on a mission to bring their dad home. Scott Piwinski has terminal throat cancer and the community came together to grant his final wish. Quadruplets Nick, Danielle, Rachael and Sarah Piwinski were preparing to spend their last Thanksgiving with their dad. “My dad. He means everything to me,” Nick said. “It definitely has been a struggle. I’m grateful for my siblings,” Danielle chimed in. 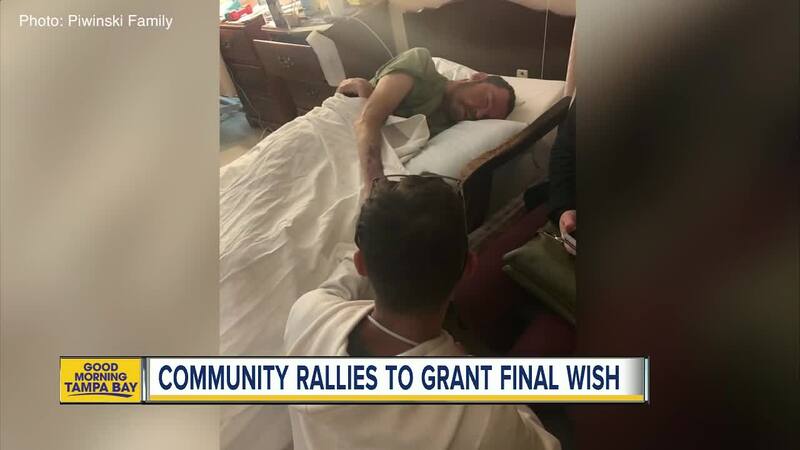 Together, the 21-year-old siblings worked to complete their dad’s final wish — to spend his remaining days in his own home. “For him to come home one last time and spend it with us — for hours, days or weeks — is going to be incredible,” Rachael said while wiping away tears. But two years fighting terminal throat cancer took a toll on Scott and his Palm Harbor, Florida home. From a hole in the roof to stained carpet, the home was in need of some TLC. “The entire house was not in any shape for him to come home to,” Danielle said. So the siblings put out a call to the community and Scott’s Coast Guard family, where he served as a chief for more than two decades. Almost immediately, dozens of volunteers fixed the roof, put in new floors and prepared Scott’s bedroom for his return. “They said if we were in this situation, we know Scott would do the same,” Sarah said with a smile. Next door neighbor Melissia Delgado was one of the volunteers to chip in. Even strangers like Carissa Konopack donated an entire Thanksgiving meal. “It just touched me so deeply and I really felt like I wanted to help too,” Konopack explained. The Piwinski siblings hoped to bring their dad home by Thanksgiving, but an insurance mix-up pushed back their plans. However, he did return home Friday afternoon, much to his family's delight. But they spent the Thanksgiving holiday at Suncoast Hospice. “That means the most to us," Danielle said, "that we’re all together."